For a fabulous treat, add these delicious soft and chewy Pecan and Lime Sugar Cookies to your baking list! I love citrus desserts, and on most days, given the choice I will most readily choose a citrus dessert over a chocolate one. I also love adding nuts to sweets, and pecans, because of their inherent subtle sweetness, are an excellent choice for adding some crunchiness to baked goods. I’ve made this recipe for Pecan and Lime Sugar Cookies from Food and Drink magazine several times now and never tire of it. 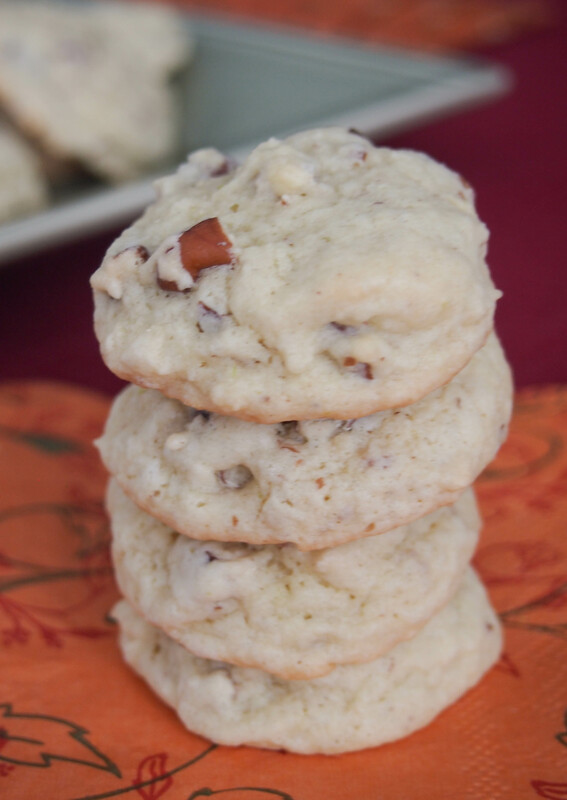 The lime zest gives the cookies a delicious flavour and the pecans add a really nice crunch. The cookies are easy to make, taste amazing and since the recipe makes about 60 cookies, this recipe is great for the holidays. Make a batch and keep some in the freezer for unexpected guests or you can give some away as a host/hostess gift. Enjoy! Position a rack in the middle of your oven and preheat it to 350°F. Line two sheet pans with non stick baking mats or parchment paper. Zest lime; squeeze 3 to 4 tbsp lime juice, set aside. In the bowl of a stand mixer, using the paddle attachment, cream together butter and sugar until light and fluffy. Add the vanilla, zest and juice of the lime; beat until lightened. Stir in the flour mixture along with the pecans. Using a small cookie scoop, scoop cookie dough and drop 2 inches apart on lined baking sheet. Bake for 10 to 12 minutes or until edges are lightly golden. Let cookies cool on the baking sheet for a few minutes then transfer them onto cooling racks to cool completely. Cookies can be kept at room temperature for 3 to 4 days. They can also be frozen, just wrap them up well and store them in an airtight container. Remove the cookies from the freezer a few hours before serving them. I just did!!! Definitely I love them! The lime and the pecan together make a great combination!!! That’s great, happy that you love them! They look so good! I am sure I would love those! Thank you so much Maria! If you like lime then you will love these. You should give them a try and let me know what you think!